In fact, professional sports originated in the mid-20th century at the instigation of IMG founder Mark McCormack. However, as more and more evidence of studying the gladiators’ topic suggests, modern sports have striking similarities not just with gladiatorial fights, but with what was going on around them. As it turned out, thanks to the analysis of the gladiators’ bones, they had received high-quality nourishment (of a far better quality than that of the Roman Empire’s average inhabitant), as well as a high level of medical care. 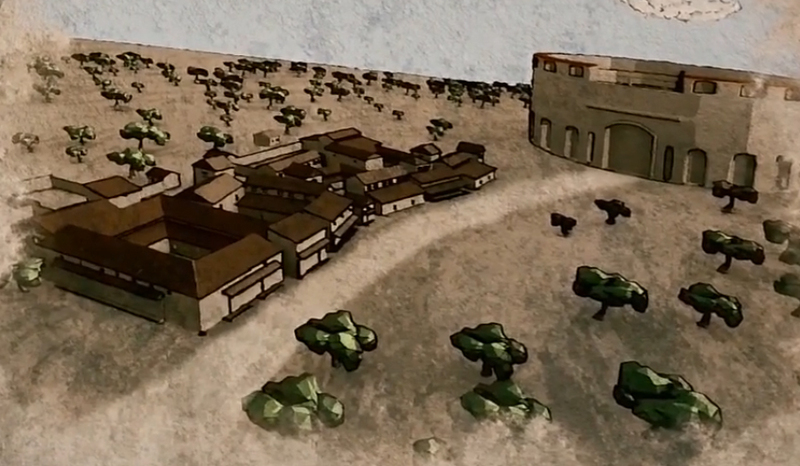 With the help of modern technology, archaeologists were able to discover the complex infrastructure around the coliseums throughout the former Roman Empire. This infrastructure not only demonstrates quite professional and luxurious opportunities for athletes’ training and recreation. Gladiatorship grew out of the Roman Empire’s PR into business. At least, there was an obvious income from what we call a matchday today, i.e. the revenue from sales around fights. In modern interpretation, professional sport was an answer to the desire to improve the quality of the sport itself. To raise his/her level, the athlete needs to train more, work on his/her tactics and psychology. But to get time for this, he/she has to take it from something else. And, of course, something else is his/her job. When professional sports reached its next limit, marketers began to look for a new way out of the situation. Qualitative work on the athlete’s personal brand is just such the way out. That is where one should expect the emergence of an increasingly serious competition in the coming years. At the moment, the athletes’ personal brands are still too weak. In my article on the Floyd Mayweather vs Conor McGregor fight, I’ve cited Neymar’s example, whom they wouldn’t even let to Jimmy Kimmel’s show. The most Neymar managed to get in the US was to shoot from the roof of one building to another into the goal where Guillermo, Jimmy Kimmel’s assistant, was a goalkeeper. Yet during his first attempts, Neymar did not even manage to make the ball reach a nearby building. But how is the athlete supposed to find time for work on his/her personal brand, if much time is spent on sports training? As in many other aspects of life, it remains only to invest in his/her own team of assistants, able to solve many issues. But even after finding a good team of assistants, the athlete needs to raise his/her own intellectual level to understand the numerous processes going on around the personal brand’s building. In this case, there is nothing left for him/her to do, but to maximally give up his/her personal life. If you want to start a family, have fun in the evenings and real weekends, the today’s generation of young athletes with such a set of beliefs will not be able to build a normal career and earn good money. I emphasize: this is true not only for sports. Do you remember how Hollywood actors used to get married and have kids? Now, the actors understand that having promoted their brand, they must squeeze out a maximum of it. If they shoot in one or two disastrous films, their career quickly declines. First, they are invited to movies with an average rating of 5 on IMDb and 15% of positive reviews on Rotten Tomatoes, but behind these films, there is already a frank thrash, the business model of which is built on the possibility to monetize the yesterday’s star name. A familiar story, isn’t it? When an actor’s or an actress’s career is at the zenith, they are of a particular interest to film studios. Here there are both the usual logic that the now popular name will increase the movie’s chances of success and neuromarketing nuances such as priming. Look at Dwayne Johnson’s daily routine. As Dwayne himself admitted in one of the photos’ captions in Instagram, to manage to act in all hot projects, he had to go to the training every single morning at 4 A.M. Do not even ask yourself how incompatible it is with one’s health. Thus, we come to understand the rule #1: Be ready to make a really serious sacrifice. It’s easy to give up a lot when you are making up a development strategy in a calm atmosphere, but it’s very hard to do it in real life. It is especially true for young people under the age of 25 (I’m going to describe below the reason for this particular age). Our body has certain features formed by evolution over a long time period. To solve the situation with sheer willpower, which is rather easily “turned off”, is not that simple. Realizing the importance of working on a personal brand, Dwayne Johnson takes part in projects involving social marketing (for example, an anti-poaching campaign) even during the period of his highest workload. As is known, if social marketing and cause-related marketing are an option for developing countries, for the US, Western and Northern Europe they are mandatory. Cause-related marketing is actually the social marketing, but with a benefit for the company’s brand. Only for this type of marketing to be effective, the consumer shouldn’t understand that the brand benefits from using it. And there will always be some benefit for the brand if it is not just anonymous altruism from the company. Cause-related marketing has an impact on the consumer’s unconscious mind. As the well-known Cone Communications statistics show, 88% of American consumers want this type of marketing from brands. So, cause-related marketing becomes mandatory. A big plus in the case of social and cause-related marketing is that we like to engage in altruism. Let me remind you that from the point of view of evolutionary psychology, altruism increases our chances of survival (for there can come help in response at the right moment), and therefore, of the reproduction, which is our main function from the genes’ point of view. And nature has invested the love for altruism in us through positive emotions. Therefore, we deduce the rule #2: Use cause-related marketing. The most interesting thing is that according to Pixability, the greatest engagement in cause-related marketing is raised by the issue of inequality. Let me remind you that genetically our species is prone to democracy. We are very social, which is considered by many to be the main distinguishing feature of our species (not the intellect, which is by the standards of nature not much ahead of that of our closest relatives). Therefore, altruism + inequality = your path to success. Depending on the target audience and the segment in it, you can touch on different topics of inequality. Unfortunately, there are still too many problems in our world, both inside and beyond our species. If you sincerely try to help solve even a small problem, this will not only impart positive to solving the problem itself but will also serve as your altruistic contribution, which will both positively affect you psychologically and have a significant impact on your personal brand and its positioning. In pursuit of one particular goal, when an athlete or a team of people helping him/her are eager to achieve it, many important factors are often overlooked. The qualitative development strategy of any brand, a personal one as well, includes many features, which should ideally be based on a certain theoretical foundation. But often people’s laziness (let’s hope that it is laziness, not lack of knowledge), even that of the specialists, brings adjustments to the brand development. This time, we are not going to address numerous mistakes, including the top clubs’ ones. 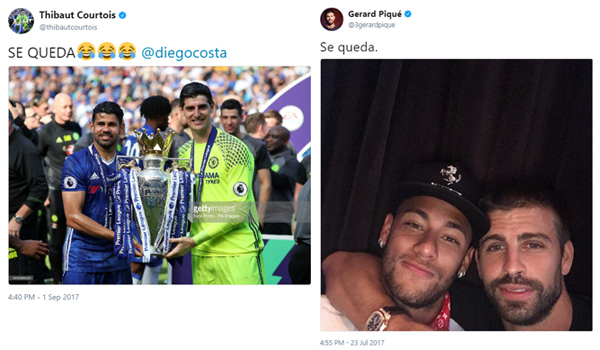 I’ll just give an example from Chelsea goalkeeper Thibaut Courtois, who used a pretty good joke on his Twitter with reference to Barcelona defender ​​Gerard Pique’s tweet that Neymar remained in the Catalan club. Courtois posted a photo of him and Diego Costa and signed it in a way similar with Pique and Neymar. The tweet has received a high virality, but in terms of working with a personal brand, a serious negative feature strikes the eye. Thibaut Courtois used a photo with a stock photo agency’s watermark. Things like this immediately cast a shadow on Thibaut Courtois’s personal brand. I refer such things to paracrises. Seemingly, they cannot be compared to real crisis situations, like doping use or an interview about one’s own team coach in Eugene Konoplyanka’s spirit. But for a personal brand, it can have a high cost. A potential sponsor’s logic is simple, as such inadequacies increase the risk of cooperation. If the risk rises, the price goes down. There is a very subtle line that will transfer you from contracts with top sponsors to contracts with specific brands working with not the most solvent audience. But once you find yourself beyond this line, there is, in fact, no way back. There is a way further on: to the place where the unnecessary brands of Lance Armstrong and Tiger Woods are. Thus, we came to the rule #3: Keep a close eye on all the personal brand’s details. When you do not overlook a single trifle, you can think about the formation of really interesting PR strategies for the brand development. They can be aimed at narrow segments of professionals, so ordinary fans may not even be aware of them. But this is just the place where you’re getting extra points for your brand. By selecting a segment with the help of various insider tools, you increase your own brand value for this segment. I’ve already provided an example of the way it works with humor: a person claiming a higher intellectual status will look for humor that will contain jokes with the logic that will be understandable only to a certain group. And the person gets pleasure from being able to unravel this logic. It is a very interesting tool that must be definitely used if you are building a really big personal brand. So, the rule #4: Manage to find interesting tools for interacting with each of your target audience’s important segments. In most cases, during the construction of athletes’ brands, many people limit themselves to a standard set of channels and tools. Relatively speaking, it gives 80% of results with 20% of the efforts exerted. Today, that’s enough for many to bring their personal brand to the very top, since in fact, no one is trying to achieve more in sports. But in the near future, that will not be enough. Competition is increasing from all sides. Now, it requires investing the additional 80% of effort to get real 100%. And there is nothing terrible about it. The world around us is developing, and we must work better to deservedly find ourselves in it. The brain’s prefrontal cortex of the representatives of our species develops up to the age of 25. We can say that a person is out of his/her adolescence only at 25. The prefrontal cortex is interesting because it can restrain the amygdala’s impulsive desires, which are often harmful in modern society. Therefore, before the age of 25, one must most carefully work with the component of intemperance, try to clearly explain in detail the biological problem and the negative consequences that intemperance may bring to the personal brand. In any crisis situation, the only effective method is the opportunity to make the audience feel your situation from the side you need. In this case, the person’s mirror neurons start working. In this case, if handled correctly, it is even possible to extract positivity from a crisis situation. There is a concept of immersive journalism, which demonstrates the importance of emotional immersion. We need to immerse ourselves in a story emotionally, to “activate” mirror neurons. Of course, from the ethical point of view, big questions arise, as we simultaneously see both the ease of manipulation depending on the story’s presentation and the prospects for a complete reorganization of journalism. For the athlete’s personal brand, there is a hidden understanding of the importance of an emotional contact establishment. At present, there is too much quality content around to compete with it. So compete for emotions. Instead of trying to influence the conscious mind of your audience, begin to directly influence the unconscious one. Building a quality personal brand is an important tool for it. The IKEA effect, which I mentioned earlier, demonstrates that the more effort we invest in the product, the more we appreciate it. Depending on the context, that is the way the value is added to the products that might not previously have such a value. The most interesting thing is that this effect can be used in different areas, clearly understanding the line, after which consumers will abandon the product. And, of course, the IKEA effect can be used in the fans and athletes’ interaction. This does not imply it should be used, but depending on the positioning, you can find a creative approach and give fans little influence in a clearly limited framework. Therefore, this proposal continues the rule #4 on finding interesting tools for interaction with important segments of your target audience. But eventually, everything comes to the quality of content. I earlier referred to the instance of Jeremy Corbyn. Before the parliamentary elections in the UK, the leader of the Labor Party demonstrated an example of how to keep your brand level, while being interesting to people who seem to be too far from it. The election results proved that Corbyn’s strategy had justified itself. Unfortunately, many brands still believe that one should communicate with each individual segment in its specific language. As a result, the brand forgets about its positioning and begins to drop down to the development level of adolescents who surely lack the necessary experience and knowledge, and therefore, create the worse content than the professionals do. But we continue to watch movies made by professionals or drive cars designed and assembled by professionals, don’t we? You will never miss your chance to create negative somatic (emotional) markers in relation to your brand. It’s not worth repeating after AS Roma. It’s great, of course, when the Italian club’s digital team is in the US, but their trick with downshifting, that they are so proud of, has no right to live even in Snapchat. It is a mixture of YouTube amateur videos and Snapchat personal pages. But if you look at the way many brands use Snapchat, you will see that one can always find the opportunity to speak a new language qualitatively. Or one can, for example, swear, convincing himself/herself and all around that it is common among all really intelligent people. In fact, AS Roma has quite an interesting content, which can be aligned with, but at the heart of any activity with the brand, there should be the understanding of brand positioning and of the somatic marker hypothesis. Our brain does not operate with logic. Conscious mind is just the tip of the iceberg. No matter how much we dislike it, we are guided by unconscious mind. An additional and pretty significant plus in quality content is that brands are interested in becoming part of your content. Sponsorship goes beyond the usual framework. For example, City Football Group is doing it by trying to create interesting sponsorship activation in its social media. Yes, they do not always succeed, but they do not fall below a certain line in pursuit of a short-range hype, endangering their own brand. If you are deliberately abandoning your content quality in the pursuit of the target audience’s particular segment, you lower the value of the entire brand. And accordingly, you lower the quality of those sponsors who will be interested in you. It reminds the rule #3 by its logic, but it’s still about something else. So, the rule #5: Regulate each of your actions with your brand positioning. To put it more broadly, it is attention to any of your actions. Your positioning becomes you, so it’s best to build the positioning on your personality and beliefs as much as possible. In this case, it will be easier for you to change yourself in negative moments and you will use less control over your actions. But otherwise, you cannot become the number one in your business. And even if you do not become the best, you will be much higher than if you do not set pretty high aims.